Kids, don’t ever do what I did. 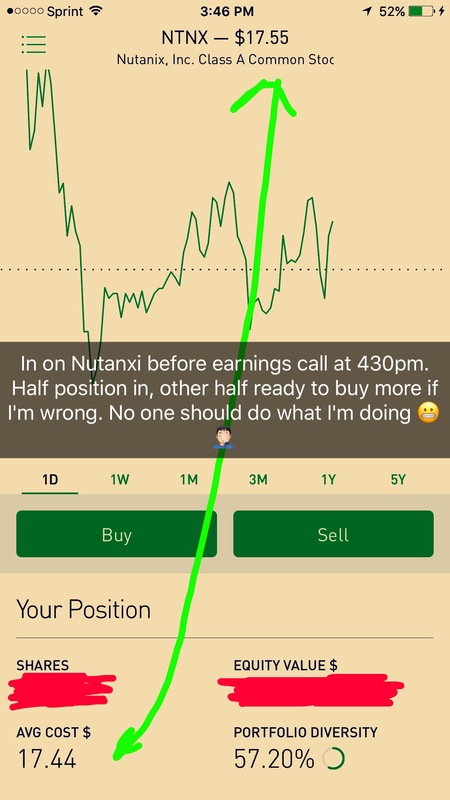 But if you felt compelled to do so, this is how its done.Yesterday’s trade, as seen on my twitter and Snapchat, was a result of a few key points I gathered from the conference calls of two other companies. 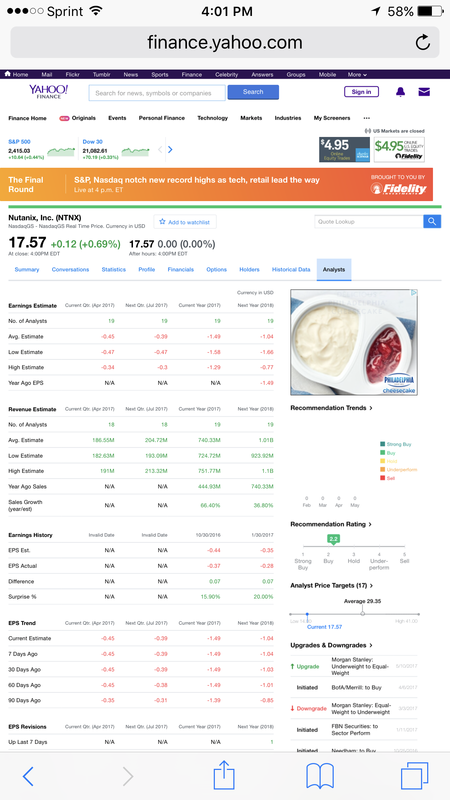 Seagate (STX) and PureStorage (PSTG). Seagate spoke about the increase in data generation as a result of more people being engaged on mobile applications. Every swipe, every tap, every location ping, everytime you do anything on your phone generates data. Data is the new gold of the common era, but only if you know what to do with it. Otherwise, to quote the movie There Will Be Blood, “its all just mud in the ground”. PureStorage repeated the same thesis: everything we do is making more data which is increasing the demand for data analytics which itself is demanding faster chips with greater fidelity to store more information. And that’s why I bough Nutanix, a company that helps other companies gather and organize the data they accumulate and then make sense of it in accordance to their respective sectors. 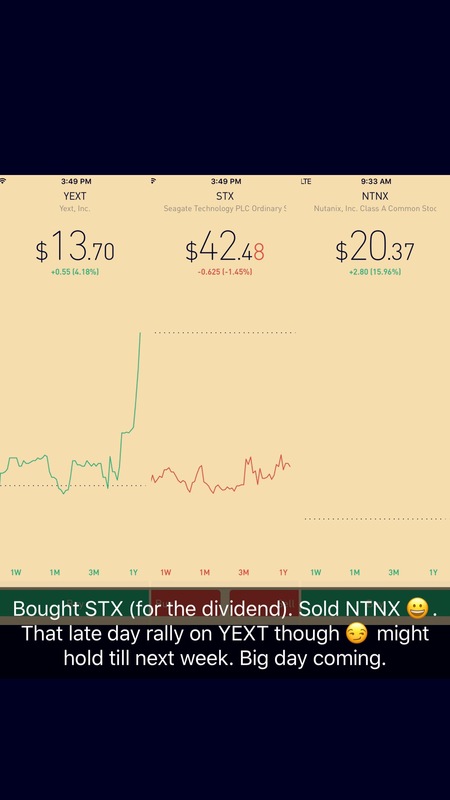 The Trade: buy a 5% stake at the opening, buy another 5% if it goes lower throughout the trading day. Buy 15% more near the end of the day. Leave 50-60% cash on the side JUST INCASE the earnings report disappoints. Were that the case, you can still buy more when the stock drops, minimizing your average cost basis, which then minimizes the size of your loss OR it can allow you to profit off the short term bounce. THIS, as some of you may know, is called a deadcat bounce: a bad stock that drops and is destined to go lower but has a quick 5 minute rebound in the stock price between 9:45 am and 10:30am. NEVER hold a deadcat bounce beyond 10:30… it almost always ends up going lower.